What is that noise? Can you hear that buzzing sound? It's like someone is running a wood planer on idle across the field there. Do you hear it? What is it? I think I'm getting closer. Now it sounds like a small plane over my head. Its constant, like what Spiderman's spidy sense might sound like. Wait, look at the tree there; it's moving. Wait...its....its bees, tens to hundreds of bees!! This is the conversation I had with the dog this afternoon as we played fetch after work. The large ash tree in my yard was literally alive with the continous motion of the bees. Once I realized what the noise was it was a bit unnerving to stand under the tree like I normally do to kick the dogs soccer ball. Once I got over the thought of getting stung I started to grin at the buzzing reminder of spring. Its like it was an alarm clock telling me it was time to awake and get into spring. This is kind of cool. The Sussex Literary Initiatives and Cultural Events group has asked me to mentor part of a writing workshop to be held in Sussex. The date is June 2nd but I will fill you in on details as they become available. This is very flattering, as I am certain there are many people involved that could easily host such a mentoring session for youth. It is nice to learn that my writing is being recognized in writing circles. When you continue to write and simply do it for the enjoyment of writing, I think, good things simply happen. I look forward to this event and likely learning more than I might teach. It is so easy to occupy your mind and soul when playing outdoors. There is never a lack of something to do. Not long ago though there was someone who cleverly created a link between technology and the outdoors. You can have the best of both worlds, unless of course you'd rather sit on the couch. Geocaching blends gaming and internet technology with an outdoor treasure hunt and luckily for me I've been able to mesh that into my job as well. Everyone likes a treasure hunt whether you're young or old. It being the Wednesday before Easter many of you are probably right now gearing up for one of the biggest treasure hunts of the year. Imagine if someone hid your favorite Easter treats all over Kings County and provided you with the coordinates on how to get there. All you have to do is follow the electronic pointer (GPS) and get close. From there put your senses to work to locate the treat. How can't you find that fun? Geocaches are diverse. They range in size from the size of your pinky to the size of your head and contain a wide array of little trinkets or treasures. You can find them in many locations such as streetscapes or deep forested ravines. This diversity broadens the appeal of geocaching to a wide audience and it was this wide audience that the Kennebecasis Watershed Restoration Committee wanted to tap into. 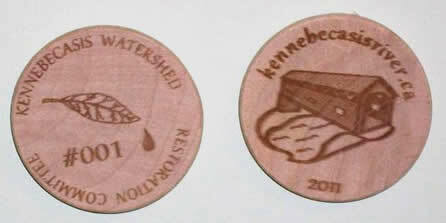 The Kennebecasis Watershed Restoration Committee (KWRC) has created a number of geocaches. They contain information on healthy living and on ecosystem health. There are five KWRC geocaches, one for each sub-watershed, and each provides educational information on different topics. They also contain a customized, non-trackable, wooden geocoin. A geocoin, for those that regularly geocache, is a collectible. The KWRC geocoins are chronologically numbered and dated. The KWRC will use the numbered coins as a way to award players. If they check the KWRC website, which is found on the geocoins, they will be encouraged to "Like" their Facebook page. Through this action they might win some prizes through random draws conducted by the KWRC but only if they possess the geocoin that matches the number drawn. Geocaching with the KWRC is a great activity that provides you the possibility to win free stuff, the chance to see some great landscapes, and an excellent form of exercise, all while learning. For the KWRC it provides the environmental non-profit group with increased exposure to a broad audience and educates them on how through conserving and protecting our natural ecosystems we can all live a healthier life, while actually encouraging them to get off the couch. If this doesn't get you itching to be outdoors, how about the fact that fishing season is upon us? The season will likely be early this year so you don't want to wait to long before getting on the water. More than likely I'll be telling fish stories soon here in my column. I wrote this sometime ago and it was printed in the Kings County Record. As part of my day job I am contracted by the provincial government to perform "RiverWatch" duties and thus I get to observe river ice at various stages. The late stages of thawing typically interest me the most as it provides some great angles for taking pics. Hope you enjoy the read. You can climb it, slide and skate on it, sculpt it, and even eat forms of it. As a hockey player my favorite thing to do is skate on it but for this column I want to write about the natural beauty of river ice. The ice changes minute to minute. It heaves and moans as the air temperature rises and falls. Depending on the light conditions the ice can appear angelic or depressing. The diverse character of ice has led me to often stop and take pictures of it. Like a good model it always takes a great picture. Frozen waterfalls are like a room full of models. Every icicle, every water drop creates an opportunity for a great picture. Every frozen cascade or stranded ice sheet is a playground to explore. The smooth, hard top surface of an ice sheet is a stark contrast to the brittle, rotting, rock carved, newly exposed underside. Up close or from a distance the ice is attractive its white glare catches your attention against the dark slate bedrock that serves as its backdrop. Your adventurous side wants to climb both the rock and ice and your appreciative side makes you take it in before tackling the challenge of scaling the slippery face. The best time of year to observe ice is during the late days of winter or early spring days as it is melting. As the sun and water work to naturally sculpt and smooth the ice it glistens as it succumbs to the natural forces. This in no way means ice is powerless. If you have ever sat on a lake shore and listened as it loudly cracks as it pushes against the shore, the sound will give you a haunted feeling. Its physical power is easily demonstrated when, as water makes the change to ice it expands. If the water was sitting in an old tree trunk or in a seam of a rock the ice will crack them both open. The strongest man in town couldn't do that without the help or a tool of some sort. One of the coolest features of ice is the way the water of a stream runs beneath it. Now before you step out on a deep ice covered river, make sure the ice is thick enough, I suggest no less than 4", to hold your weight. To be safer, and to see this cool feature better, I suggest wandering up a small stream where you likely won't get that wet if you accidently fall through the ice. The thin, glass like ice, is the best for watching and listening to the stream gurgle below the ice. From time to time air bubbles will move below you as the oxygen searches for a way to the open atmosphere. This site can be a bit mesmerizing and like so many other features of river ice it can hold you in a curious gaze. Fortunately for me, through my work with the Kennebecasis Watershed Restoration Committee I often get up close and personal with river ice and often I get to have lunch on a blanket spread over a stranded sheet in front of a covered bridge. Get out there and explore the ice near you but be cautious and wander safely.